New York, March 29, 2017 – The American Academy of Arts and Letters announces the recipients of its 2017 architecture awards. The Academy’s annual architecture awards program began in 1955 with the inauguration of the Arnold W. Brunner Memorial Prize and has since expanded to include four Arts and Letters Awards. This year’s winners were chosen from a group of 27 individuals and practices nominated by the members of the Academy. The jurors were Elizabeth Diller (chairman), Henry N. Cobb, Peter Eisenman, Kenneth Frampton, Hugh Hardy, Steven Holl, Thom Mayne, James Polshek, Robert A. M. Stern, Billie Tsien, and Tod Williams. The awards will be presented in New York City in May at the Academy’s annual Ceremonial. Work by the winners will be featured in the Exhibition of Works by Newly Elected Members and Recipients of Honors and Awards, on view in the Academy’s galleries on Audubon Terrace. $10,000 to an American architect whose work is characterized by a strong personal direction. Photo Captions: 1. 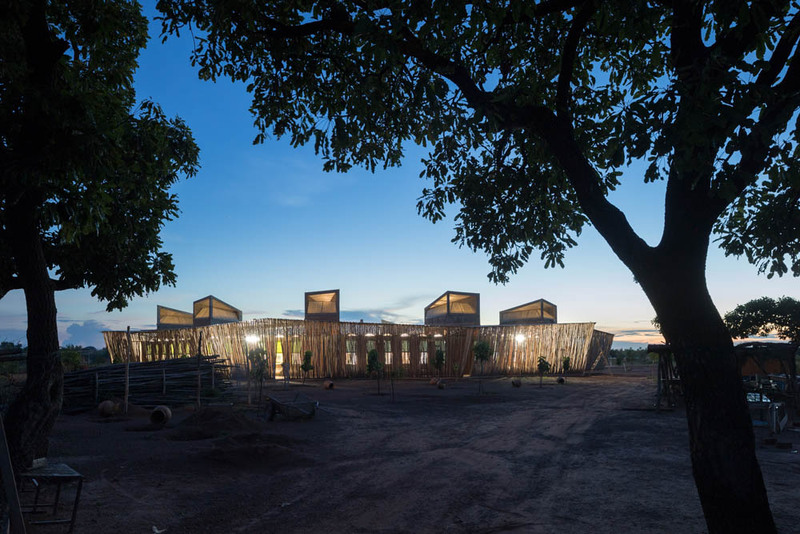 Lycée Schorge Secondary School, Kéré Architecture, photo by Iwan Baan. 2. Stony Island Arts Bank, Rebuild Foundation, photo by Tom Harris. 3. Building Art: The Life and Work of Frank Gehry, Deckle Edge, 2015. 4. Cooper Hewitt Garden, Hood Design Studio. 5. Poetry Foundation, John Ronan Architects. Diébédo Francis Kéré “is an alchemist,” said Billie Tsien, “working with local materials and technology— mud and hand labor — he has designed buildings of meaning and beauty.” In projects across the world, local environmental and economic context informs his work in scale, material, and construction, developing what Tsien calls “an elegant and resourceful language of building.” With funds raised by his own Kéré Foundation during studies at Berlin’s Technische Universität, he completed his acclaimed Gando Primary School (2001) and subsequent extension (2008) in Burkina Faso. He founded Kéré Architecture in 2005, and has brought his compelling designs to multiple continents as its principal. Notable works include the National Park of Mali (2010); Léo Surgical Clinic (2014); and Schorge Secondary School (2016). His Opera Village in Laongo, Burkina Faso, is ongoing, and he is currently planning the Burkina Faso National Assembly in Ouagadougou. In June of this year, Kéré’s Serpentine Pavilion will open in Kensington Gardens, London. Theaster Gates transforms the urban landscape in the service of art, creating platforms for enrichment and expression in forgotten spaces. As founder of the Rebuild Foundation, director of Arts and Public Life at the University of Chicago, and installation artist, his projects reclaim physical and intangible culture from neglect and ruin, preserving black history and shaping black futures. The Rebuild Foundation’s Stony Island Arts Bank (2015) houses their archive, galleries, and community spaces in a formerly derelict building, creating an intersection for neighborhood heritage, arts, and scholarship. Other notable projects include Archive House (2009), Listening House (2009), and Black Cinema House (2014), all in Chicago. Author, critic, and lecturer Paul Goldberger’s “broad influence stems from his capacity to engage the reader in a mutual appreciation of architecture,” said Kenneth Frampton. Currently the Joseph Urban Chair in Design and Architecture at The New School in New York City, he taught previously at the Yale School of Architecture and the Graduate School of Journalism at the University of California, Berkeley. Through his books and as architecture critic for the New York Times, the New Yorker, and Vanity Fair, Goldberger has earned a “reputation as the doyen of American architectural critics,” Frampton said, “making the topic readily accessible to the society at large.” Notable books include Building Art, (2015);Why Architecture Matters (2009); Building Up and Tearing Down: Reflections on the Age of Architecture (2009); and UP FROM ZERO: Politics, Architecture, and the Rebuilding of New York (2004). Walter Hood is “dissolving the boundaries between landscape architecture, urban design, and public art,” said Henry N. Cobb. Founder of Hood Design Studio in Oakland, California, his work embraces and beautifies urban spaces, both large (Greenprint project, Pittsburgh, 2009-present) and small (Splash Pad Park, Oakland, 2003). Hood’s “remarkably diverse and deeply evocative body of work,” Cobb said, “has touched the minds and hearts of communities across the United States.” Notable projects include the Arthur Ross Terrace at the Cooper Hewitt Museum, New York (2016); the Broad Museum Plaza, Los Angeles (2015); and the Bayview Opera House, San Francisco (2016). In April of this year, his Witness Walls project will open in Nashville; the International African American Museum in Charleston will open in 2019. “With elegance and rigor, John Ronan continues Chicago’s history of serious architecture of national and international significance,” said Tod Williams. With a focus on space and materiality, his designs are unfolding experiences that invite and reward curiosity. “The Poetry Foundation (2011) is his most eloquent and transcendent completed work,” says Williams, and “current projects show bold and innovative thinking at a variety of scales.” These include the Gary Comer Youth Center; Gary Comer College Prep; 151 North Franklin Office Tower; and IIT Innovation Center, all expected to be completed in Chicago in 2018.